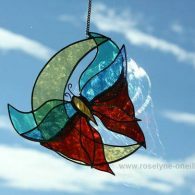 Roselyne is a full time artist based in Aberdeenshire, Scotland. Work is primarily influenced by equine related subjects, as well as the wildlife, landscape, natural history and folklore of Scotland. Roselyne studied Art & Design in the late 80's, and worked in the graphic design industry in Aberdeen before taking time out of her career to raise a family. 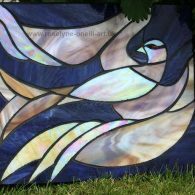 Established as a professional artist since 2006, Roselyne has successfully exhibited in local galleries and exhibitions and has sold to overseas collectors. 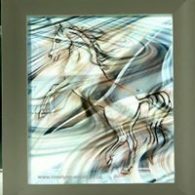 A love of horses since childhood remains a natural influence on her work, however the source of inspiration covers much more. 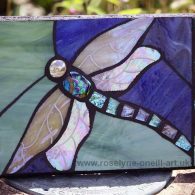 Roselyne works in various media from painting and drawing to stained glass and mosaic, she is also a keen photographer. 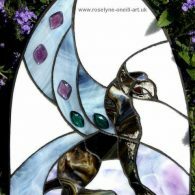 We are delighted to have Ros design a collection of Glass art pieces for the collaborative collection with Esther Green “Flights of Fancy”. It is the first showing of this medium for us after having the pleasure of showing her paintings several times. Some of the pieces can be displayed outdoors as well as inside.